I am trying to make a FreeDOS boot disk with OSX that's compatible with the V86 library. I need to do this in terminal (in a bash script). I'm doing all of this on OSX High Sierra. The boot disk I'm attempting to create is an .img of a floppy diskette. I'm aware there are other ways to provide bootable disks to V86 such as a hard drive image or a cdrom .iso, but I'm trying this way and would like to at least understand what I'm doing wrong. I suspect the problem I'm having is in attempting to properly create the diskette image's Master Boot Record (MBR). In the old days on DOS or on Win9x machines, I seem to remember needing to run a format command with some switches on it that would make the MBR on the disk rather than just a FAT table at the front of the disk - though I'm not sure if I'm understanding MBR correctly. My basic, simplified understanding of the MBR as that the MBR is the first 512 bytes of the diskette, which specifies how large the disk is, as well instructions that tell the BIOS to jump to the first instruction of a boot loader that'll kickstart the operating system. For example, on a DOS diskette there is/was a COMMAND.COM fiel on it. Presumably in that case, the MBR was written to tell BIOS to start execution on the first instruction in COMMAND.COM. Figuring out where the first instruction is seems like it could be complicated because a number of things need to happen (I think..). The first 512 bytes of the disk will be reserved for the MBR, then after that a FAT is written down which takes another X bytes of the disk, then after the FAT, there's empty space to put files down. When a file such as COMMAND.COM is written to the disk, the FAT is updated with information about where on the disk the bytes are stored. For the MBR to know where to jump to to find the first instruction of COMMAND.COM, it would need to know where COMMAND.COM is stored, which could be anywhere on the disk in the empty space after the FAT, right? # question: are dos boot diskettes supposed to be FAT12, FAT16, or FAT32? # question: does the copy order of these files matter? That script above gets me close to bootable, the V86 startup shows "FREEDOS" rather than complaing about the disk not being bootable, but it just hangs after saying "FREEDOS", rather than continuing the boot process. I've also tried various other ways/attempts of creating the MBR, in all of these cases I created the blank img file with the dd command, then ran these on it to create the MBR, then copied files as shown above. # Attempt #1: After the files are copied to the target disk, try to copy the 512 byte MBR from the source image to mine, if this worked I would be surprised, it didn't. # this shouldn't work afaik because the MBR on the source image will have instructions to jump to the first instruction in COMMAND.COM as it's layed down on the source disk, which likely isn't where it is on our target disk. I've also tried various incantations where I mix the commands above, such as running diskutil partition then running the fdisk -i command to see if there's something fdisk will do to fix the MBR for the given existing partition. 1: Use the FreeDOS installer in a virtual env such as QEMU or VirtualBox, then save an image of the created floppy diskette. 2: Use an ancient machine to create a bootable diskette from an actual DOS or Windows installation. If you're unfamiliar with V86, it's a x86 emulator written on top of asm.js that runs a virtualized OS in a browser. # to determine the reserve was 1 logical sector, extract the boot code. # note: the order of the files does not seem to matter. To determine the size of the floppy image and the type of FAT, enter the following sequence of commands. The command below mounts the image. The output from this command is shown below. This output shows the volume can be identified as FREEDOS. Enter the command below to get information about the image. Below is the pertinent output from this command. So this is where the bs=512 and count=1440 parameter values were determined to create the empty image file. Also, this is where the -F 12 parameter value was determined for the newfs_msdos command. Enter the command below to eject the volume. Below is a table taken from this pcguide website. 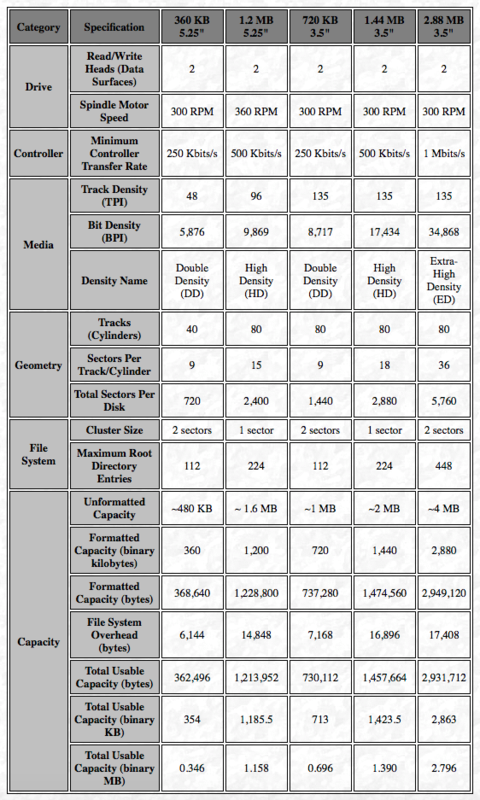 The "Total Sectors Per Disk" row shows the image to represent a 720 KB floppy. This where the -f 720 parameter value was determined for the newfs_msdos command. Some of the rest of the integer values can be taken from this table. The values can also be extracted from the BIOS Parameter Block stored in the freedos722.img file. The command below can be use to display the Volume Boot Record (VBR) stored in the freedos722.img file. The BIOS Parameter Block starts at offset 0x0B. The structure of the BIOS Parameter Block is outlined in the output from the man newfs_msdos command. Below is the pertinent output from this command. Note: The output below shows the mapping between the newfs_msdos command options and the values stored in the BIOS Parameter Block. Note: The parameter [-s] big total sectors should be ignored. Use the parameter [-s] total sectors instead. A more eloquent way to determine the values in the the BIOS Parameter Block would be to first enter the function definitions given below. These functions have two positional parameters. The first is the offset into the freedos722.img file. This value must be entered using hexadecimal digits. The second is the number of bytes to read. Valid values are 1, 2 and 4. The table below shows the commands used to extract the following BIOS Parameter Block values from the freedos722.img file. The bytes per sector and reserved sectors values were used to determine the bs=512 and count=1 parameter values for the dd command used to create the boot code file boot.img. The -b 1024 parameter value for the newfs_msdos command was determined by multiplying the bytes per sector and sectors per cluster values together. Not the answer you're looking for? Browse other questions tagged macos bootable-disk . Why is my Partition a folder?